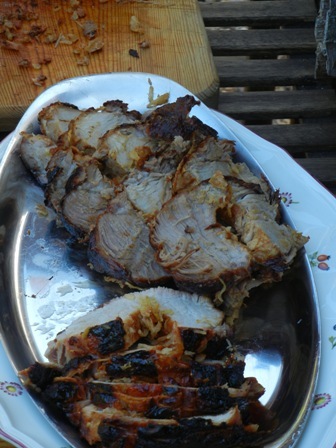 Actually, ‘traditional German ‘Schwenkbraten’ is when the pork is on a movable gridiron which is beeing moved over a coal fire. 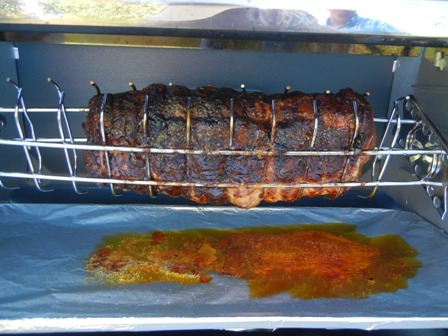 The above picture is more of a rolled piece of pork on a rotisserie. 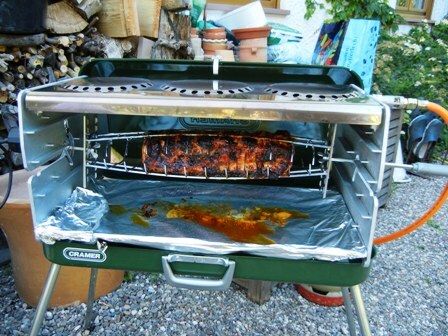 However, that may be, the German love to grill as much as the Australians do. And since the summers in Germany tend to be unpredictable, often short, every opportunity to be outside and operate a grill is used to everybodies delight. 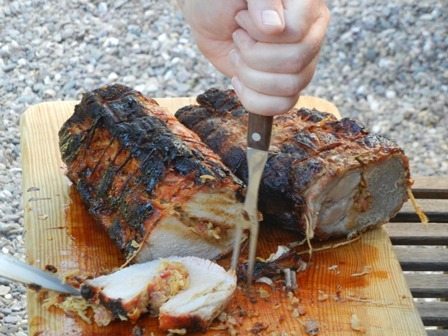 What a delicious piece of meat? Note: Let me tell you that the above pictures were taken in Eitelsbach, Ruwer. My old friends Elisabeth and Juergen Olk had organised a family reunion to which we were kindly invited. It was a lovely summers afternoon, with little children darting through the garden, and adults chatting, telling stories, and drinking and eating. Apart from some Ruwer wines, mostly Riesling, the preferred drink was beer. We had a delightful time. What a beautiful day that was. This entry was posted on Saturday, November 17th, 2012 at 1:15 pm and is filed under culture, food, food and wine. You can follow any responses to this entry through the RSS 2.0 feed. You can leave a response, or trackback from your own site.